Diamond Head Gardens is a three-story walk-up constructed in 1960. The building has 42 residences, in one and two-bedroom floorplans. One-bedroom unit interior sizes are about 590 square feet. Two-bedrooms have approximately 720 square feet interior. Most if not all units have lanai areas with another 80+ square feet of space. Amenities of the property include a barbecues, swimming pool and a community laundry. Diamond Head Gardens is pet friendly, one pet per residence. Dogs are allowed up to 30lbs in size. 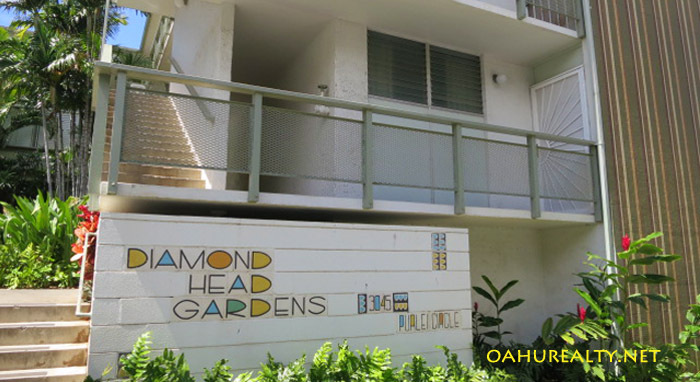 Diamond Head Gardens was originally sold in leasehold. Most, if not all of the units, have been converted to fee simple. The building addresses are 3045 and 3055 Pualei Circle. Associa is the management company for Diamond Head Gardens. Phone: (808) 836-0911. Diamond Head Gardens also has a resident manager at the building.